When a traditional optical disc is created, information is copied onto the disc by creating light spots within the dye that coats a standard disc. When a user “burns” a new DVD using a DVD-burner drive in a computer, the optical nature of the dye is being altered to match the data. The data is read by looking at the contrasting areas of the disc, but has the flaw of degrading over extremely long periods of time due to fading in sunlight. 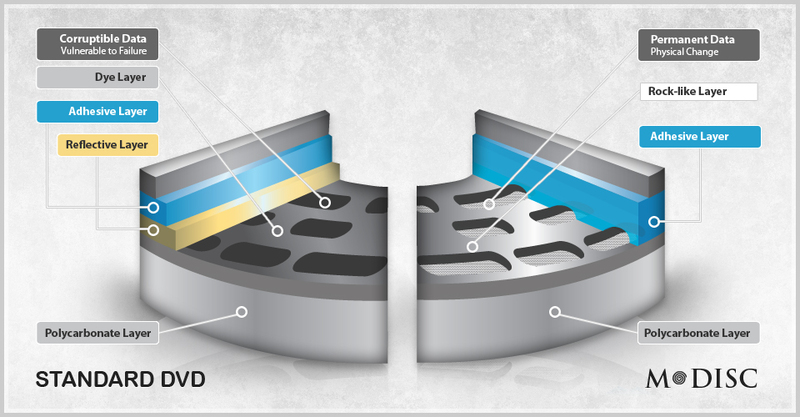 Optical discs are also susceptible to humidity and the adhesive holding the dye onto the disc can slowly degrade over time. Millenniata has created a version of the DVD called the M-Disk and it’s definitely unique compared to optical DVD discs. The disc is designed from a rock-like, synthetic material that is comprised of metals and a variety of inorganic materials. When data is transferred to the disc, the syntethic material melts and creates tiny holes that are read as data. This etching is permanent and doesn’t fade over time. The disc is also stable up to 932 degrees Fahrenheit and doesn’t have the same problems with humidity or other weather conditions compared to optical discs. Millenniata claims that the disc was put through a series of stress tests by the U.S. Navy’s Weapons Division and the M-Disc passed through unharmed. 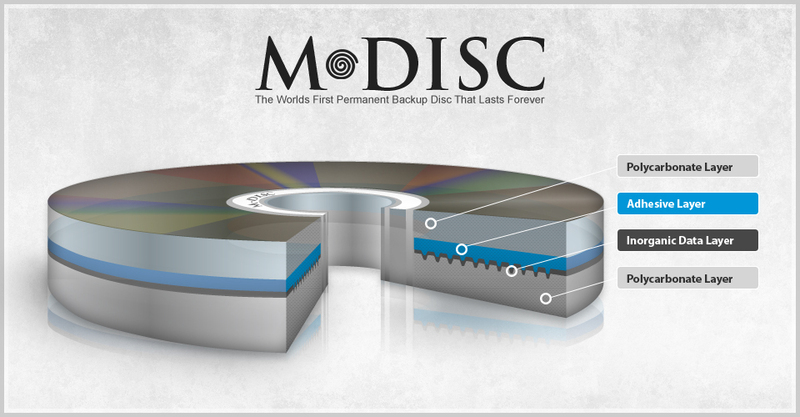 Millenniata also believes that the disc will last at least 1,000 years based on internal testing, a 10x improvement over golden archival DVDs. Targeting the price similar to golden archival discs that are currently available, Millenniata is looking to charge about $3 per M-Disc. The capacity is on target with 4.7GB single-layer DVD discs, but the company is looking into expanding into Blu-ray. Drive prices aren’t available yet and are likely to be priced for commercial markets initially before consumers will be able to purchase the drives on sites like Newegg. Burn speeds are relatively low at this point, specifically 4x.